Mary Alice had her knee replacement surgery on Monday. She was very nervous going into surgery. But she was chipper and just slightly pale after surgery - she recalls someone in the operating room talking about fishing and she heard the last few pounds on her new knee being put in place. Her doctor mysteriously left for 15 minutes before the surgery started and then zoomed back - can't wait to hear what he left for?! Guy and I waited in the Green Room. Virgil is not the type of guy for idle chatter so we asked if we could take off and explore Waconia while Mary Alice was in surgery. He jumped at the idea so we found a cute little bistro called "the green room" and halved a burger and each had french onion soup. It was great. How funny to have a place called "the green room" pretty close to a hospital. We also got Guy a haircut at the local barber - it was an awesome haircut - so nice to be out during a workday! The barber had a petition for getting rid of the Cormorants in Lake Waconia and Lake Minnetonka. We saw tons of Cormorants in Lake Minnetonka while boating. Turns out they are native to the gulf and eat 1lb of fish each a day and are decemating the fish stocked in lakes as well as pushing out native birds like the many duck species in Minnesota and the Canadian geese and trumpter swans. 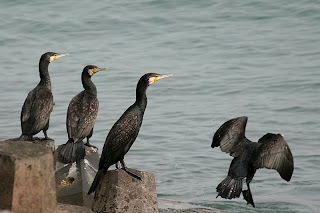 These Cormorants are coming up from the south of the USA due to global warming and the DNR says they cannot be shot/exterminated. I didn't say anything to the Barber but I agree with the DNR - ironically, I saw the Barber drove a Hummer. You can't foul the air and warm the earth without living with the consequences. By the way, lake Minnetonka and lake Waconia hit record low water levels this year. Is this a harbringer of times to come when Minnesota's 13,000 lakes dry up? Same for Superior - record lows - what happens when the glacial melt lakes go away? Who knows - I just read on Wikipedia that Cormorants were in Minnesota in the 1800's - so who knows what's what on all of this climate change. I am as baffled and concerned as everyone else.